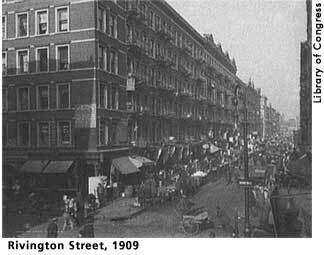 After having finished boarding school in Europe, ER returned to the United States, and resided, among other places, in New York City. In 1903, nineteen- year-old ER decided to become actively involved in the work of the Junior League for the Promotion of Settlement Movements, an organization dedicated to addressing the social and economic problems rapid industrialization inflicted upon immigrant and urban America. For her contribution, ER worked at the College Settlement on Rivington Street, teaching immigrant children on New York's Lower East Side how to dance and stretch. While working at the settlement, ER witnessed first-hand the abject poverty in which most of her students lived. The experience gave her insight into a world to which she and FDR (whom she was dating at the time) had never been exposed, and it pleased her to know that she was working to improve the lives of others. FDR accompanied her to the settlement several times and was as horrified as she at the conditions that prevailed in the tenements and slums below Houston Street. Later, ER recalled these visits as eye-opening experiences that helped spur FDR's later efforts to address poverty and the social ills it produced. Cook, Blanche Wiesen. Eleanor Roosevelt, Volume One, 1884-1933. New York: Viking, 1992, 135, 137-138.